When many people hear the word groundwater they imagine a raging underground torrent of water flowing along a pathway called an aquifer. Well, sorry to disappoint you, but you could not be more wrong about how groundwater exists and flows. In this post we will discuss the very basics of groundwater science (hydrogeology) and flow. As the name implies groundwater is simply water that exists underground. It is the opposite of surface water, which exists on the surface of the Earth such as lakes, rivers and oceans. Groundwater is an extremely important resource for industry, drinking water and other applications, however, it is generally quite poorly understood. The branch of geology that researches groundwater is called hydrogeology and is still a relatively new sector of the geological sciences. As I have already mentioned groundwater exists underground. However, there are still lots of misconceptions about how people envision groundwater. Many see large underground lakes and rivers, and while those do exist, they represent an infinitesimally small percentage of all groundwater. Generally speaking groundwater exists in the pore spaces between grains of soil and rocks. Imagine a water filled sponge. All of the holes in that sponge are water-filled. By squeezing that sponge we force the water out, similarly, by pumping an aquifer we force the water out of pore spaces. There are lots of terms in hydrogeology, most of which are very simple, but essential. Here are a few of the big ones and their meanings. Porosity: Porosity is an intrinsic property of every material. It refers to the amount of empty space within a given material. In a soil or rock the porosity (empty space) exists between the grains of minerals. In a material like gravel the grains are large and there is lots of empty space between them since they don’t fit together very well. However, in a material like a gravel, sand and clay mixture the porosity is much less as the smaller grains fill the spaces. The amount of water a material can hold is directly related to the porosity since water will try and fill the empty spaces in a material. We measure porosity by the percentage of empty space that exists within a particular porous media. Permeability: Permeability is another intrinsic property of all materials and is closely related to porosity. Permeability refers to how connected pore spaces are to one another. 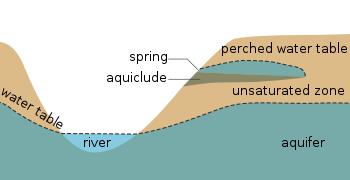 If the material has high permeability than pore spaces are connected to one another allowing water to flow from one to another, however, if there is low permeability then the pore spaces are isolated and water is trapped within them. For example, in a gravel all of the pores well connected one another allowing water to flow through it, however, in a clay most of the pore spaces are blocked, meaning water cannot flow through it easily. Aquifer: An aquifer is a term for a type of soil or rock that can hold and transfer water that is completely saturated with water. That means that all it is simply a layer of soil or rock that has a reasonably high porosity and permeability that allows it to contain water and transfer it from pore to pore relatively quickly and all of the pore spaces are filled with water. Good examples of aquifers are glacial till or sandy soils which have both high porosity and high permeability. Aquifers allows us to recover groundwater by pumping quickly and easily. However, overpumping can easily reduce the amount of water in an aquifer and cause it to dry up. Aquifers are replenished when surface water infiltrates through the ground and refills the pore spaces in the aquifer. This process is called recharge. 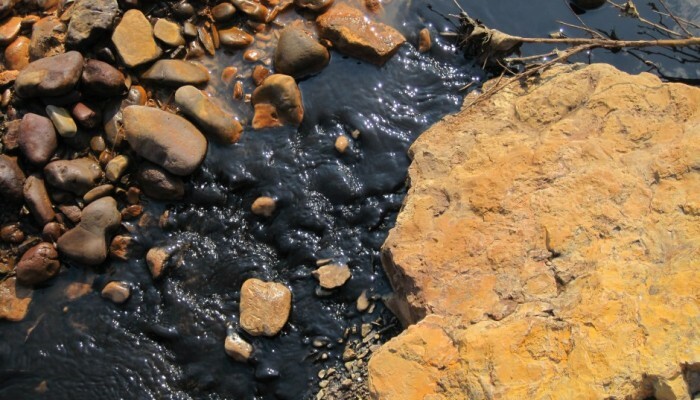 It is especially important to ensure that recharge is clean and uncontaminated or the entire aquifer could become polluted. There are two main types of aquifer. An unconfined aquifer is one that does not have an aquitard above it but usually does below it. The other type is a confined aquifer that has an aquitard above and below it. Aquitard: An aquitard is basically the opposite of an aquifer with one key exception. Aquitards have very low permeability and do not transfer water well at all. In fact, in the ground they often act as a barrier to water flow and separate two aquifers. The one key exception is that aquitards can have high porosity and hold lots of water however, due to the their low permeability they are unable to transmit it from pore to pore and therefore water cannot flow within an aquitard very well. A good example of an aquitard is a layer of clay. Clay often has high porosity but almost no permeability meaning it is essentially a barrier which water cannot flow through and the water within it is trapped. However, there is still limited water flow within aquitards due to other processes that I won’t get into now. Water Table: The water table is a term that hydrogeologists use to describe an imaginary surface that usually exists underground. Below the water table all pore spaces are completely filled with water and above it they are filled with air. The water table is the boundary between these two zones called the saturated and unsaturated (vadose) zone. In order to imagine the water table it helps to imagine a layer that exists underground rather than a line as the water table is a surface that extends in every direction. The top of the water table is determined by water pressure. When water pressure in the pore spaces is the same as air pressure we are at the water table. The water table is subject to rise and fall depending on pumping of water out of the aquifer or other changes. Finally, if the water table and the surface of the Earth intersect we have a spring. The study of hydrogeology is a very mathy one. There are lots of complicated equations, Greek letters, and funny squiggles. However, you don’t need an advanced degree in math to understand the basics, but it helps to know a little bit. Basically all ground water flow can be described by a single simple equation. Sure, there have been lots of modifications made to fit specific conditions and circumstances, but it all comes back to the same basic principles outlined in a single equation. That equation is called Darcy’s Law (cue dramatic music). Q is the discharge or the amount of water that flows out of a given material over a set amount of time. K is called the hydraulic conductivity and is a property of every material that tells us the speed any liquid moves through a given material. It is directly related to the porosity and permeability of the the material and the density of the liquid in question. For water we don’t need to worry about the density though, just the porosity and permeability. (h1-h2)/l is usually represented by the letter i and is called the hydraulic gradient. It is the difference in water level between the two points of measurement divided by the distance between them. So now we understand some of the basic principles governing groundwater flow, but we haven’t discussed why it would flow from one place to another. We all take it for granted that groundwater is not stationary and moves, but why is that? The answer is shockingly simple, and lies in the fact that everything in nature is in a constant struggle to find balance. Water flows from areas of high energy to low energy in an attempt to distribute that energy evenly throughout the water table. In this case energy is not a synonym for electricity, but energy in all forms, such as pressure or concentration differences. In the case of the water table the driving force is usually differences in pressure and elevation along the surface of the water table which lead to water flow. In hydrogeological terms these energy differences are referred to as hydraulic head, which can be measured at any point in the water table. It is helpful to imagine the weather when we think of groundwater flow. We all know that wind moves from areas of high air pressure to low air pressure bringing weather changes and temperature fronts in with it. Groundwater behaves the same and moves from places with high hydraulic head to low hydraulic head the same as the wind. Obviously there is much more to discuss in the field of hydrogeology. The big topics being this like contamination or freshwater resources. However, in order to discuss those topics properly it is crucial to have a solid grasp on groundwater terms and basics. Please feel free to to comment if you have any suggestions for future posts on groundwater. Thanks for reading. Note: This is a re-post from my old, less visited geo-blog. It was previously posted on June 13, 2011. Matt Herod is a Ph.D Candidate in the Department of Earth Sciences at the University of Ottawa in Ontario, Canada. His research focuses on the geochemistry of iodine and the radioactive isotope iodine-129. His work involves characterizing the cycle and sources of 129I in the Canadian Arctic and applying this to long term radioactive waste disposal and the effect of Fukushima fallout. His project includes field work and lab work at the André E. Lalonde 3MV AMS Laboratory. Matt blogs about any topic in geology that interests him, and attempts to make these topics understandable to everyone. Tweets as @GeoHerod. Another great post Matt. I hadn’t read it on your other blog. Way to share the groundwater love! Thanks man! You and Jenica going to be around over the Thanksgiving weekend? We should head to the Fiddle one evening?